Within a labyrinth of intrigue, one man´s shocking revelations from the past lead to a greater understanding of life´s universal values during a heroic but traumatic journey of redemption. A body is recovered from a river in April 1990. Months earlier, a young John Lennon fan and an elderly Irishman met in a U.S. hospital. A groundskeeper completed the triad. Before long, the past begins to unravel and a connection to WWII is uncovered. Secrets flourish, but nothing is what it seems. Through tragedy, a disease and a modern literary masterpiece, an extraordinary twist of fate awaits the three. Michael Palmer is the Canadian-born author of Dark Side of the Sun, a well-received and much loved book that has garnered media attention across Canada. Although his roots are in Prince Edward Island, he was born in Antigonish, Nova Scotia, and is a graduate of Saint Francis Xavier University. When not immersed in travel adventures, he works in finance and marketing. In addition, he continues to find time for his study of World War II, which has spanned more than two decades. 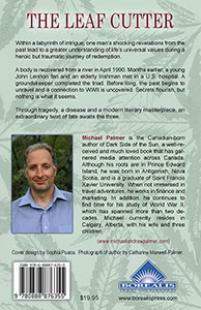 Michael currently resides in Calgary, Alberta, with his wife and three children.